Specially designed wheel for making flush cuts in a variety of wood materials including soft and hard wood, plywood, composites, laminate flooring, drywall, PVC and plastic. Uses include cutting baseboard for flooring installation and use with the Saw-Max Miter Guide. Four-inch diameter, carbide abrasive. Dome-shaped wheel for flush cuts up 3/4"
For larger material removal of lime plaster, hard-finish plaster and abrasive concrete. Hard metal bonding construction resists loads caused by strong abrasive materials. Optimal use includes asphalt, fresh concrete, pumice stone and plaster mortar. Ideal for sanding thin layers of thermo-plastic protective paint finishes on concrete and fibreglass. The medium-hard bonding and wide segment spacing have been designed for low working temperatures to prevent protective paint finish from smearing during grinding. 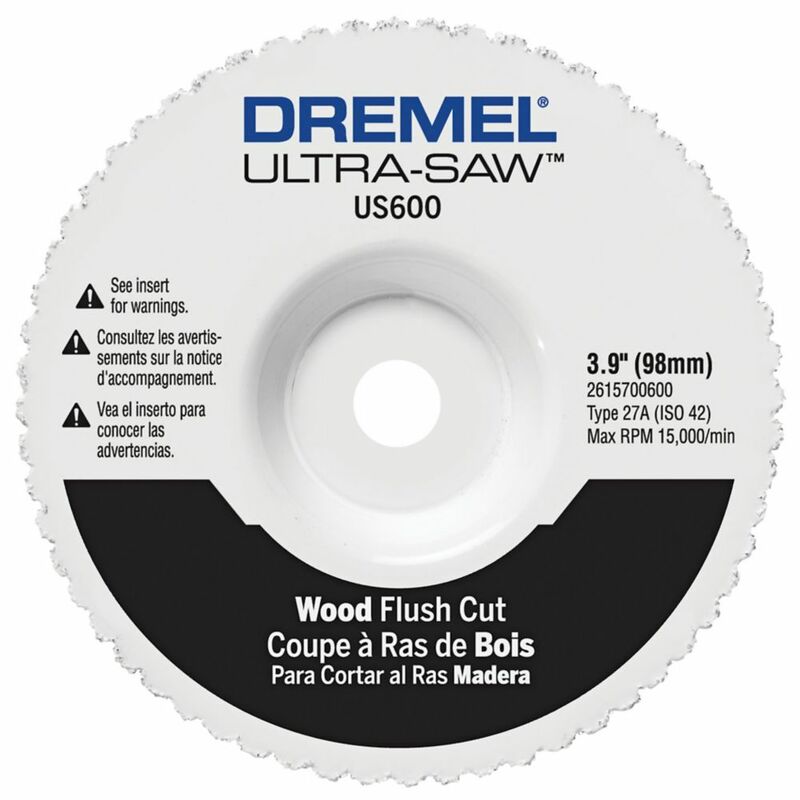 Use your Dremel Ultra-Saw for concrete, masonry and tile surface preparation. The US410 diamond surface prep wheel uses patented diamond embedding technology to quickly smooth bumps and cracks in concrete before finishing and to remove thinset mortar for tile remodelling. Four-inch diameter wheel. Wood Flush Cut Wheel Specially designed wheel for making flush cuts in a variety of wood materials including soft and hard wood, plywood, composites, laminate flooring, drywall, PVC and plastic. Uses include cutting baseboard for flooring installation and use with the Saw-Max Miter Guide. Four-inch diameter, carbide abrasive. Wood Flush Cut Wheel is rated 4.4 out of 5 by 8. Rated 4 out of 5 by melvin from It made it easy to cut flooring next to wall. It made it easy to cut flooring next to wall. Rated 5 out of 5 by Anonymous from The Flush Cut blade works great!... The Flush Cut blade works great! Rated 4 out of 5 by LtLLeader from Worked great to flush cut a back splash off to... Worked great to flush cut a back splash off to install new counter top. Cut thru some screws and still got the job done. Rated 5 out of 5 by Papa from Did great job on cutting door trim for tile. Had to shim up to correct height. Wish it would cut ... Did great job on cutting door trim for tile. Had to shim up to correct height. Wish it would cut a little deeper.